The "five a day" fruit and vegetables UK government advice has omitted two very important factors. 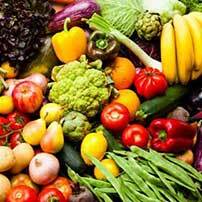 The rainbow of colours of fruit and vegetables is also important and the amount of each that should be consumed. Nature has kindly colour-coded foods for us and each one has different compounds which the body needs on a regular, and often, daily, basis. There is no point eating five of one colour per day as the vital nutrients of the other colours will be deficient in the diet. Artificially coloured and genetically modified foods confuse the picture further so should be avoided because they do not tell us what the food contains and are not balanced in nutrition like nature has already provided for us. Plus the artificial additives can cause many health problems especially for children, the elderly or those with allergies or a weakened immune system. Foods are being genetically modified to withstand more powerful pesticides, herbicides and fungicides. This means the natural balance in food is being altered and humans are ingesting traces of ever increasing powerful chemicals that are poisonous. The balanced food of nature has the right amounts of phytochemicals and minerals already present. Altering this by artificial means is dangerous because it is not yet known exactly what the roles all these chemicals play in the human body and may cause problems with the bacteria, fungi and virus that plants have spent thousands of years developing resistance against or indeed cause superbugs to develop. There are over 100 minerals and many hundreds of other types of nutrients which work with each other on a molecular level. Exactly what works with what, when and why has not yet been established, therefore, crossing species before knowing this important information is like putting the cart before the horse. This ignorance about human bodily micro processes is why stripping the necessary nutrients from foods such as grains and sea salt before selling it for humans consumption is a practice that should be ceased. Adding a cheaper or artificial version of those stripped out nutrients afterwards or adding other nutrients that don't even belong in that food to beguile the consumer into purchasing the product is simply cheating people out of real healthy naturally balanced foods. For instance, the type of vitamin D that humans can absorb is vitamin D3 but often, it is vitamin D2 which is not easily absorbed, that is added to foods and sold as a supplement. Vitamin K2 is required to direct calcium into the bones and should also be consumed when extra vitamin D is required in the diet but this s rarely advised by doctors. Vitamin B2 (riboflavin) is very difficult to add to foods and gets destroyed by light so when cereals say they have added riboflavin it does not necessarily mean that you will be absorbing enough of it on a daily basis from cereals. Some industries even sell the important compounds they strip from human food products on to other industries to make bigger profits rather than leave them in the food for human consumption such as sea salt. Cheap nutrient-free table salt and addictive sugar is added to everything so that the consumer will repeatedly buy and eat it, as are many other artificial chemicals to add colour, taste, shelf life and to hide impurities. This is an unfair practise which is causing more malnutrition than anything else and leading to illnesses and conditions which would not otherwise exist. Indigenous tribes, who eat only natural foods, do not suffer with allergies, cancer, diabetes and other, often diet induced, diseases like the developed world does. Only traces of many minerals are required by the body but due to today's farming and food processing techniques much of the mineral content has been lost. Minerals are something many people do not consider as essential as protein or vitamins but they are absolutely vital for many cellular processes. Although the body can store minerals, it cannot manufacture them so consuming a wide range of coloured natural foods can help replenish stores that are used up or lost. This is as important for those that are unwell or taking medications as it is for those that do strenuous exercise or sports. Minerals are lost through perspiration and many drugs (including alcohol) block the absorption and manufacture of the nutrients which help absorption of minerals or cause the body to lose minerals in the urine. Alcohol causes the body to expel zinc in the urine. This may be the reason why healthy and fit athletes also develop cancer. These minerals are vital for the body to manufacture the messenger proteins that tell abnormal cancer cells to 'commit suicide' ( apoptosis). If athletes do not replace the minerals they lose through perspiration and use up quickly through intense exercise for a prolonged period of time cancer cells are likely to proliferate. Consuming one of each colour is vital for optimum health. Some of the nutrients are not only responsible for the colour in natural foods but have important functions in all of the body's cells. 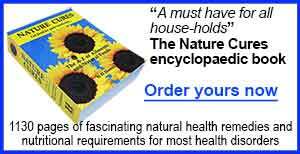 See the Minerals and Organic Nutrients pages. Natures colours give strong clues which we seem to ignore. For instance; beetroots possess betacyanin which gives them their deep red colour and provides the essential ingredient which can assist the body with recovery from many ailments. It stops the spread of cancer tumours, prevents diseases of liver, kidney and pancreas and treats ulcers in the stomach, strengthens the lungs and the immune system, improves the vision, good for eye redness treatment, reduces pain after intense physical training and menstrual pain, eliminates hard stool, positively affects the colon, regulates high blood pressure, improves bad breath which occurs due to indigestion of food, helps treat acne and creates healthy skin. Therefore, if foods of a particular colour are avoided there are many great health benefits that are missed out on and many essential organic nutrients and minerals. Some vegetables have more than one colour for instance spring onions have green leaves and white roots. This means there are the nutrients of both these colours present so the whole of the plant should be eaten which will provide the nutrients of the green and white categories below. The same goes for beetroot and beetroot leaves. Some vegetables, fruits and nuts contain different healthy nutrients in both their flesh and skins so both should be consumed. Apples, aubergines. potatoes and sweet potatoes are examples. Orange, lime and lemon peel has powerful antioxidant properties, is nourishing for the heart and should be included in the diet. Skins should only ever be discarded if they are completely inedible such as bananas, Swede, watermelons, pumpkins etc. Just ripe bananas contain slightly different phytonutrients than very ripe black bananas. Both are good for different reasons. 1. GREEN Examples: Apples, alfalfa, artichoke, ashitaba, asparagus, avocado, basil, bell peppers, broad beans, broccoli, Brussel sprouts, cabbage, celery, chilli peppers, chives, collard greens, cress, courgettes, drumstick, green grapes, green olives, green beans, herb leaves, kale, kiwi fruit, lettuce, lime and peel, mung beans, okra, oregano, parsley, peas, pumpkin seeds, rocket, seaweed, spinach, spring onions, sprouted seeds, grains, nuts and legumes and winged beans. Chlorophyll is the nutrient which gives the green colour. Chlorophyll can mask some of the colours of other nutrients in foods. 2. YELLOW/ORANGE Examples: Apricots, bell peppers, butternut squash, carrots, chick peas, chilli peppers, corn, ginger, lemons, lentils, mango, oranges, papaya, peaches, pineapple, prickly pear, pumpkin, Swede, sweet potato, tangerines, turmeric, the peel of yellow and orange citrus fruits and whole grains. Curcumin gives turmeric its yellow colour and anthoxanthins, beta-xanthins, carotenoids and/or chalcones are the compounds which give the yellow/orange colour and curcumin gives turmeric its yellow colour. To absorb fat-soluble carotenoids the foods containing them must be consumed with a little oil such as coconut, hemp seed, nut, olive, rapeseed, rice bran, sesame, fish or nut oils or other fatty foods like avocado or oily fish. 3. RED Examples: Apples, asparagus, bell peppers, cabbage (red), cherries, chilli peppers, cranberries, goji berries, grapefruit (pink), grapes (red and black), guava, oranges (blood), pears (red), mung beans, parsley, persimmons, pinto beans, prickly pear, radishes, raspberries, rhubarb, red chokeberry, red kidney beans, red onions, pomegranates, raspberries, rhubarb, rose hips, saw palmetto berries, strawberries, sumac, Swiss chard and tomatoes and watermelon. Beta-carotene , betacyanins and lycopene are the nutrients which give the red colour. To absorb fat-soluble carotenoids, the foods containing them must be consumed with a little oil such as coconut, hemp seed, nut, olive, rapeseed, rice bran, sesame, fish or nut oils or other fatty foods like avocado or oily fish. Astaxanthin is the most powerful antioxidant known to man and causes the pink and red colour in seafood such as lobster, prawns, salmon, and shrimp. The highest concentration of this antioxidant is found in krill oil. 4. BLUE/VIOLET/PURPLE/BLACK Examples: Amaranth, acai berry, aubergine, beetroot, bilberries, black bananas, black beans, blackberries, black chokeberry, black currants, black tea, blueberries, broccoli (purple variety), cherries, chokeberries, cranberries, dates, elderberry, figs, black grapes, black olives, kidney beans, maqui berries, mulberries, onions (red), navy beans, plums, poppy seeds, potatoes (red skinned), prickly pear, prunes, purple broccoli tops, radishes, raisins, sweet potato (skins), Swiss chard and winged beans. Anthocyanins or betacyanins are the nutrients that give the red/blue to purple and black colours and are often most concentrated in the skins and stems of food crops. 5. WHITE/CREAM Examples: Aubergine, just ripe bananas, Brazil nuts, butter beans, butter nut squash, cauliflower, celery, chestnuts, coconut, garlic, Jerusalem artichoke, leeks, macadamia nuts, mung beans, mushrooms, navy beans, onions, parsnip, peanuts, pecans, pine nuts, pistachios, potatoes, radishes, soya beans, spring onions and turnips. Anthoxanthins are the nutrients which give the white/cream colour. 6. BROWN/GOLD Examples: Brown rice, cocoa beans, dates, hazelnuts, mushrooms, nuts, potatoes skins, seeds and whole grains. Brown and gold foods can contain a variety of the above pigment nutrients. To make it easier to consume a wider selection of foods, and hence a wider range of nutrients without the bulk, purchase a powerful juicer. The best to use, to get the most nutrients from fruit and vegetables, are the slow juicers of at least 900 watts. 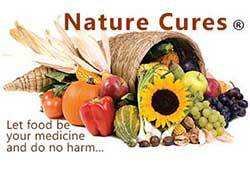 See Nature Cures Raw Juice Therapy for more information. A blender also helps to reduce bulk. Puree your selection of different coloured fruit, steamed vegetables, legumes, herbs and spices in a blender as potage soups and 'smoothies'. Add organic probiotic live yoghurt for a creamy effect. When vegetables and fruits are first chopped they should be left aside for 10 minutes for beneficial chemical reactions to take place. Then they should eaten raw or steamed and consumed straight away because they begin to lose nutritional value after this. Pre-packed chopped fruit and vegetables have very little nutritional value compared to freshly prepared natural food and often have synthetic chemicals added for preservation. To gain a wide selection of essential nutrients in small portions of sprouts try growing your own in a jam jar with just a daily rinse of water. Visit the Nature Cures Micro Diet Sprouts page to find out how to grow beans, seeds, whole grains and legumes. Nutrients from seeds, fresh or dried herbs, leaves and roots can be ingested easily without the bulk by making them into teas. Simply pour hot (but not quite boiling) water over them leave for 20 minutes then strain and sip the juice. Try experimenting and making unusual teas by mixing different herbs, spices and adding honey and fruit juices such as lemon. Drink three cups a day warm or cold with ice. Through stools, urine, tears and sweat the body rids itself of toxins that would otherwise build up and lead to sickness and disease. Fevers and skin eruptions are actually a natural part of the cleansing process and shouldn't be suppressed. Headaches can also occur but this is because toxins are being released and will be eliminated if plenty of water is consumed. Cleansing allows the body to restore balance and occurs when imbalance is too great and threatens health and life. Ingesting live organic natural plant foods encourages this process. See Cleanse and Detoxify page to find out which natural foods can help the body clean itself inside and out. To ensure against ill health there are certain natural foods which should be consumed regularly because they have properties and nutrients the body uses up and needs to replace often. It is not absolutely critical that they are consumed every single day but, if they are, the health and vitality of the body and protection against infection and disease will increase dramatically. Many can be consumed together with fruit juice, made into teas or added to meals, salads, soups and sauces. How they are consumed is a matter of choice and taste. Experimenting, by adding herbs and spices to everything, is an excellent way to gain even more essential nutrients whilst making the consumption of these foods more palatable and tasty. Fruit, leafy vegetables and herbs should have minimal cooking (steaming is best) to ensure no loss of vital nutrients. The body only needs traces of many nutrients, therefore, consuming any more than that is a waste of money and can cause many health complications. Because human bodies differ so much in size, shape and metabolism, there will never be one size fits all but the following is a guide to the amount that can provide all that is required. Along with one from each of the 6 colour categories above take these daily. at least 2 different coloured fruits per day either fresh or juiced. At least 6 glasses of pure bottled at source mineral water per day. 2 tablespoons or 1 small carton organic with live cultures. Use with fruit, whole grains, seeds and nuts or savoury dishes. Then consume one protein portion from the meat, fish, dairy, legumes, nuts or whole grains categories below per day. The entire day's portion of protein should be no larger than the clenched fist of the person eating it. This includes children too. The following foods have shown to possess the highest number and broadest spectrum of nutrients, the lowest bad fat content, the least adverse side affects and are the most beneficial to the human body's processes. If only these natural foods are consumed a noticeable difference will be felt and seen within one week. Normal weight will be regained, infections eradicated and vitality will be improved ten fold after a few weeks providing alcohol, coffee, drugs, sugar, table salt, animals fats, refined and pre-processed foods and snacks, fast foods and ready meals have been completely eliminated from the diet. This is based on organic natural food which has far higher nutrition and no chemical residues. Organ meats, poultry, pheasant, pigeon, quail, rabbit, veal and venison. Halibut, lobster, menhaden, octopus, oily fish, shellfish, squid and whelks. Barley, brown rice, buckwheat, durum wheat, millet, oats, quinoa and teff. All beans, almonds, chickpeas, cocoa beans (organic, unrefined), coconut, green beans, hazelnuts, lentils, mung beans, peanuts, peas, pine nuts, pistachio, soya beans, walnuts and winged beans. Amaranth, caraway, chia, coriander, cumin, fennel, flaxseeds, hemp, mustard, peppercorns, pomegranate, poppy, pumpkin, quinoa, salba, sesame, sunflower and watermelon. Alfalfa, ashitaba, asparagus, broccoli, celery, chicory, collard greens, cress, dill, drumstick leaves, fenugreek, holy basil, kale, kelp, lettuce, mustard, oat straw, oregano, parsley, radish, rocket, sage, salsify, savoury, seaweed, spinach, tarragon, tatsoi, thyme, watercress and wheatgrass. Aubergine, avocado, bell peppers (red, green, yellow and orange), tomatoes, chilli peppers, courgettes, cucumber, marrow and squashes. Apples, banana, baobab fruit, berries, cherries, grapes, lemons, limes, mango, maqui berry, melon, papaya, pears, pineapples, pomegranate, pumpkin, strawberries, tangerines and watermelon. Ashitaba, beetroot, carrots, daikon, garlic, ginger, onion, parsnips, radishes, suma, sumac, Swede, sweet potato and turnips. Borage, capers, corn silk, courgettes, elderflowers, marigold, nasturtium and savoury. Basil, cardamom, coriander, cloves, dill, fennel, marjoram, oregano, parsley, saffron, safflower, sage, tarragon and thyme. Alfalfa, almond, amaranth, barley, broccoli, buckwheat, cabbage, chickpea, corn, daikon, fenugreek, flaxseeds, hazelnut, hemp, kamut, leek, lemon grass, lettuce, lentil, milk thistle, mizuna, mung beans, mustard, oat, onion, pea, peanut, quinoa, radish, rice, rocket, rye, salba, sesame, spinach, spring onions, sunflower, tatsoi, turnip, watercress and wheat. See the Sprouting page to see how to grow your own in a jam jar. Chaga, maitake, oyster and shiitake. Chlorella, dulse, Irish moss, kelp and spirulina. Apricots, dates, figs, goji berries and raisins. Beetroot, blackcurrant, blueberry, carrot, cranberry, lemon, lime, maqui berry, pineapple, pomegranate, tomato and watermelon. Juicing or blending any of the other fruit and vegetables mentioned on this page is beneficial too. Coconut, hemp seed, nut, olive, peanut, rapeseed, rice bran and sesame. Cayenne pepper, cinnamon, cloves, cumin, coriander, fennel seeds, nutmeg, paprika, peppercorns, turmeric and pure unrefined sea salt or Himalayan pink salt crystals. Apple cider vinegar, black strap molasses, brewer's yeast, brine pickles, krill oil, manuka honey, milk thistle extract, miso and whey. People that avoid fats altogether, thinking they will lose weight, are in fact making their system sluggish because of nutrient deficiencies. This will not only lower their metabolism and put weight on but will affect their general health as well. This is why fat free diets never work. The western diet lacks in the different colour combinations of vegetables and fruits and large portions of just one or two colours are consumed on a daily basis. The answer to the ultimate healthy diet is to make sure certain foods are consumed at the same time in order to effectively absorb and utilise the nutrients whilst others are consumed separately. There was a myth that foods lacking in certain amino acids should be consumed at the same time as foods containing these amino acids in order to obtain 'complete protein' such as brown rice and beans. However, it has since been proved that as long as they are consumed on the same day and not necessarily at the same time there will be no problem. Foods rich in protein should be consumed separately from starch and carbohydrates for best digestion. High fat and sugary foods should never be consumed at the same time. Avoid mixing carbohydrates and starch with acidic fruits that destroy the enzyme which digests them. High sugar fruits like melon should be eaten separately from foods rich in protein or starch. Nightshades, such as potatoes, chillies, aubergine and tomatoes, should not be combined with cucumbers. Foods rich in sulphur aid in the absorption of zinc. Foods containing these two nutrients should be consumed together. This is particularly important for anyone who drinks alcohol as zinc is expelled in the urine more readily. There are two types of iron; heme found in meats and seafood; the other (non-heme) is in iron rich plant foods. Non-heme iron isn't as easily absorbed by the body. Foods high in vitamin C raise the acidity of the intestines, allowing non-heme to be more readily absorbed. Always consume vitamin C rich foods with green vegetables and green tea and never drink tea or coffee with a meal. Allow at least 30 minutes. Vitamin C rich foods increase iron uptake, while vitamin E rich foods inhibit it. Vitamin C lowers manganese and zinc, while vitamin E helps increase manganese and zinc absorption. As a result, a very high intake of vitamin C will require an equally high intake of vitamin E to maintain the same ratio. Taking excessive vitamin C supplements can elevate the blood sugar and is especially dangerous for elderly women. Foods containing the fat-soluble nutrients like carotenoids, lycopene, lutein, zeaxanthin and vitamin A, vitamin D, vitamin E and vitamin K must be consumed with some fats at the same time in order to be absorbed. This fat can be from avocado, butter, egg yolks, nuts, oily fish, soybeans or virgin cold pressed plant and seed oils. Fat soluble nutrients are stored in the body for long periods of time and pose a greater risk for toxicity when consumed in excess as supplements than water-soluble vitamins. Trace amounts of many phytochemicals and minerals are perfectly adequate. Just as a trace of poison can be fatal to humans so the same amount of nutrients can have a powerful and beneficial effect. Natural foods contain the right amounts of phytochemicals required to utilise the nutrients. Tipping the scales towards, too much protein, salt, fat and sugar and the addition of synthetic chemicals and drugs has unbalanced the human body and resulted in obesity, diabetes and serious conditions like heart disease and cancer increasing at an alarming rate. Many nutrients are stored in the body and only need replacing often when they are used up quickly by intense exercise. This is especially true of carbohydrates, vitamins, electrolytes and protein. Vitamin K2 is manufactured by the bacteria in the intestines from vitamin K1 in the diet therefore probiotic foods that feed the bacteria must be ingested regularly for this to take place. If too much sugary and animal fat foods are consumed it will feed the wrong type of bacteria in the guts and colon disorders and obesity will be the result. It can also lead to diabetes. Ingestion of strong chemicals and toxins can either expel vital elements in the urine or even replace them where they are stored in the bones and fatty tissues. Minerals and B vitamins especially can be lost or not absorbed enough alongside drugs and alcohol. Old age (65+) can affect nutrient balances as it becomes slower and harder for the body to absorb or manufacture its own nutrients and store them efficiently. Drugs, illness and infection can alter the balance of intestinal bacteria and this has an immense effect on the digestion and manufacture of certain vital nutrients. Lack of sunshine on the skin causes vitamin D deficiency. People get far less sunshine now as work and many other activities take place inside buildings and some religions force the covering of skin. The overuse of sunscreens in skin creams and makeup mean women are more prone to vitamin D deficiency. 20 minutes of midday sunshine on bare skin as often as is possible can provide all the vitamin D required. Some foods like aloe vera, aubergine, carp fish, cheese, cod liver oil, eggs, full cream cow’s or goat's milk, hemp seeds, krill oil, oily fish and wild mushrooms can also provide vitamin D.
Take a small amount of a variety of all colours of everything as often as the body desires food. Never give into to addictions for one substance or consume a portion of meat larger than the size of a pack of cards. Never starve yourself because your body will go into survival mode and then when you finally eat something the body will store fat as fast as it can to protect itself from future starvation. Starvation diets actually put weight on. Always add cold-pressed virgin oils to any vegetable dish. Try to avoid anything processed or refined in any way.